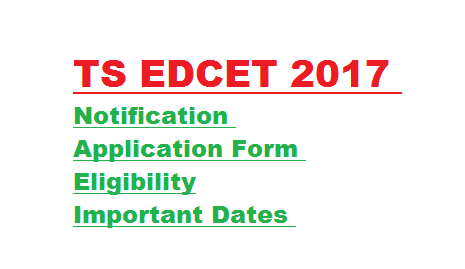 TS EdCET online application form 2018 is released, so all the interested candidates can apply for Telangana EdCET 2018. The students have to check the eligibility to start filling the application form. You can get all the details regarding TS EdCET 2018 notification from the official website. The important point is only the students who submit their applications are allowed to take the entrance examination of B.Ed 2018. Other candidates will not be allowed to appear for the examination. The Osmania University Hyderabad issued the warning about the TS EdCET 2018. So the students can fill the Telangana B.Ed 2018 form from the month of March. All the aspirants to be selected through this common entrance exam. The candidates are instructed to submit the application form before the first week of may 2018. After the due date no application forms to be entertained under any circumstances. Hall ticket number of the qualifying examination. Students have to pay the application fees to complete the application process. For general category have to pay Rs.300/- as application fee. Students can pay the application fees through the online mode. Starting of downloading admit card: 3rd week of May 2018. The students who want to pursue their career in a bachelor of education have to check the eligibility criteria provided by the Telangana state. If your eligibility does not fulfil all the aspects, your application rejected by the authorities. Candidates should be Indian nationality. There is no maximum age limit for the B.Ed. Candidates must complete any bachelor’s degree or master’s degree with 50% of marks. For reserved or physically challenged students minimum marks should be 40%. Below we shikshadarpan team providing our visitors complete details and sources for TS EDCET 2018 Syllabus and Exam Pattern,so just scroll down get complete syllabus for EDCET as well as newly EDCET Exam Pattern. So now you got the exam pattern for EdCET Exam . As from above table we can see the TS EdCET Question Paper consists of three parts. Which are named as Part A ,Part B, and Part C, and these parts have different subjects like Maths, English, Biological Sciences, Physical Sciences ,Social Studies. Now we are moving on the syllabus for EdCET , candidates who are struggling hard to select in this exam should have known the complete syllabus as well as important topics in each subject . If you are having trouble in downloading TS Ed CET syllabus 2018 then comment below ,shiksha darpan team will solve your problem as soon as possible.